On my recent travels in California Sam’s Chowder House absolutely has to be up there as one of the stand out eating experiences. Having visited a couple of times now I make a special effort to try and visit whenever I’m over there. Perched on Half Moon Bay overlooking the water, the restaurant has spectacular views and is a great place to spend the afternoon sipping a glass of wine and eating some amazing food. I’m told on a good day there’s even a chance of spotting a whale or two. The extensive menu offers an amazing variety of seafood. There is, of course, clam chowder which comes New England or Manhattan style. New England is creamy with smoky bacon whereas the Manhattan version is a tomato base. I’m yet to try this dish but it’ll definitely be done at some point. There’s so much fresh fish that comes simply grilled, in gumbos, as ceviche or some seriously delicious risottos and pasta dishes. 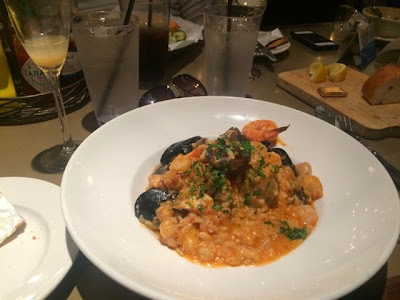 The first dish I ever had here was the seafood risotto which came with octopus, mussels, shrimp, scallops and clams. That’s heaven in a bowl right there for me. Sam’s is constantly winning awards both locally and nationally and we definitely can’t talk about it without mentioning the lobster roll. Named in the ‘Top 5 Sandwiches in America‘ on The Today Show, this roll has got some serious credit. 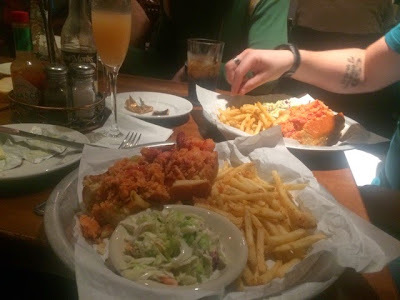 It’s packed with so much lobster meat and served with coleslaw and a choice of fries or potato chips (crisps). A really tasty sandwich and a really good filling meal. Now the seafood is obviously the highlight of Sam’s but it is definitely worth mentioning that they have a pretty decent cocktail list. 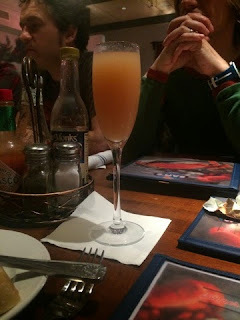 I’m fairly partial to a good old peach bellini! 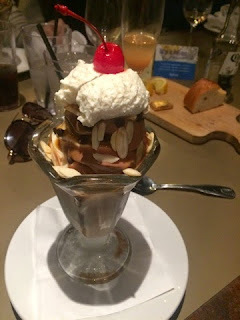 They also do a great ice cream sundae. I haven’t tried any of the other desserts as generally a nice big fat lobster roll leaves me feeling pretty full, but there is a great selection. If you’re ever doing a California road trip or staying in/near San Francisco or The Bay Area, Sam’s absolutely has to be a must-visit on your itinerary. It’s not a fancy restaurant, it’s a great welcoming family style place, serving up some of the best seafood on the West Coast. I’ve only been here in the evening so far but I’d love to get down there on a nice sunny afternoon to fully appreciate it’s excellent location.